Understanding the rheological properties of fresh concrete, the hydration phenomenon of cement responsible for structuration, the relationship between the characteristics of the porous solid obtained and its mechanical performances or resistance to the aggressive penetration requires a complex knowledge of the physicochemistry of reactive porous materials. The development of simple formulation rules therefore requires the assimilation of this knowledge and a good command of the properties of these materials. The purpose of this book is to provide the mix designer with useful knowledge on granular materials and porous materials, which will enable the innovative design of concrete. Topics covered include the characterization of granular materials, the concepts of porosity and specific surface area, and the transport properties (diffusion and permeation) of concrete. 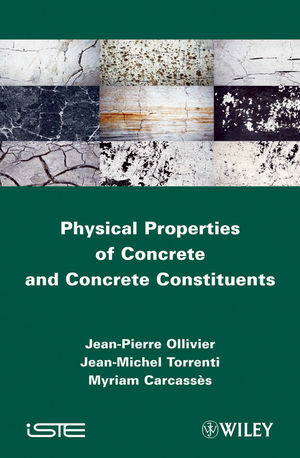 Some of these topics are already covered in other general books dedicated to granular or porous materials. The objective here is to bring them together in one book by adapting them for use by concrete specialists. Applications in the form of exercises are offered at the end of each chapter to enable readers to assimilate the theoretical knowledge and to apply such knowledge to concrete problems encountered in civil engineering. 1. Description of Granular Materials, Definitions. 3. Specific Surface Area of Materials. 4. Voids in Granular Materials and the Arrangement of Grains. 6. The Fundamentals of Diffusion. Jean-Pierre Ollivier is Emeritus Professor in Civil Engineering at INSA Toulouse, France. He has 40 years' experience in teaching building materials for Civil Engineers. The author of more than 150 research papers and 4 books on concrete technology, his main field of research is concrete durability and transport properties. Jean-Michel Torrenti is the head of the Materials department at IFSTTAR (French Institute of Science and Technology for Transport, Development and Networks) and is Professor at Ecole nationale des ponts et chausses, Paris, France. His research deals with the mechanical behavior of concrete, its durability and the coupled behavior. Myriam Carcassès is Professor at the University of Toulouse in France. Her main field of research is concrete durability and transport properties.